You’ve taken the decision to take it all off. Shaving your head for the first time can be a liberating experience. But, you need a good head razor to really do it properly. It’s a tough choice between using a head shaver to keep it short, or just taking a razor to your scalp and being done with it. I still flip between the two myself – at the time of writing, I use a combination of both! I’ll use my head shaver for most of my head, but I still like to use a razor for the back of my neck and to define a line between beard and head. Often when I’m travelling or on holiday, I’ll just take a razor with me. It’s far easier to travel with, and I like my head to look fresh for the holiday pics! Anyway, enough of me waffling on, here’s some of the best bald head razors you can use for shaving your bald head. 2 How to wet shave your head.. Properly! Firstly, we really need to divide these into both straight razors and safety razors. Some work better than others for shaving your head, but it’s difficult to know which will work best for you. If in doubt, I’d opt for a straight razor as they are the more commonly used by people for shaving their head. You’ve likely heard of the Dollar Shave Club. It’s been plastered all over the media for years now and they have tons of faithful members signing up to their service. So, you might expect to see them at the top of the list right? Well, no actually. Although I like the Dollar Shave Club razors, I hate their high prices. They can cost upwards of $2 a razor blade, which is much too expensive for me. I use a razor every week, and $2 is too much – ultimately, I like to keep it down to $1 a blade if I can. So after some research I found out that the company that produce the Dollar Shave Club razors are Dorco. And, you can buy their blades from the company directly at a much lower price. So if you don’t mind ordering in bulk and having them sent to your door every month then it’s worth going for Dorco. The six blade technology of this straight razor is awesome and I’ve never experienced any real razor burn from using their products – I have with some other razors that I’ve used. They also have an aloe vera strip that helps to soothe the scalp. Overall, the Dorco razor is undoubtedly not my favorite. I still use the handle that I bought from the Dollar Shave Club because it’s the same as the one that Dorco sells too! I’ve used the Headblade for many years – it’s actually over 20 years old, though it’s only been gaining major popularity within the last 4 or 5. The ATX specifically came out in 2012 and I’ve been using it on and off ever since. This is probably because it’s a tide piece of kit that genuinely does make it a little easier to shave your head. It’s one of the only razors designed specifically for shaving heads. It’s not groundbreaking technology, no – but it does make it easier to use the straight razor, specifically around the back of the neck, which is an annoying area to get to for many of us. You just slip your index finger through the middle of the ATX and literally run it over your head with ease. I’ve used many different razors over the years, but I have to say that this one is my favorite. I don’t bother with all of the extras like the foam anymore, I just purchase the razor and the refills for the shaver head. Anyway, this is a great option for someone looking for a razor close shave. Anywho, I did review this product on it’s own if you want a more in depth review. I’m always on the lookout for high quality razors, and you won’t get many better than the Chieftain from Vikings Blade. It’s undoubtedly the best razor for sensitive skin, so if that’s an issue for you, then you might want to have a look at the Chieftain as a possibility. The reason I suggest the Chieftain as a great option for shaving your head is that it’s designed as a safety razor. This means that the mechanism the Chieftain uses makes it near impossible to leave cuts on your scalp – once you get used to it. If you’ve tried shaving with a regular razor already, then you’ll know that this is one of the more annoying areas of shaving. A good safety razor can help reduce the likely of cuts and nicks dramatically. The Chieftain is made to be a lot heavier than your standard razor. Although you might think that it makes it harder to shave, it’s actually the opposite. The weighting of the Chieftain is designed to utilize it’s weight to make your shave quicker. As an option for shaving your head, it’s a really good choice. SAY GOODBYE TO SKIN IRRITATION: Are you tired of being left scowling at skin irritation and razor burns from your cheap, disposable razors? Not anymore! Upgrade your wet shaving experience with the ultimate, double edge safety razor and say goodbye to skin irritation and redness, once and for all! TAKE YOUR RAZOR EVERYWHERE: With no cords or batteries to hold you back, this premium shaving tool is quick to use and easy to pack and carry with you on the go! Great for business, family and holidaytravels! 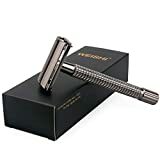 If you’re trying to save some money and are looking for a more budget friendly safety razor, another chrome option you could go for is the Perfecto. The Perfecto has an extra long handle, which is designed specifically to help your grip when you’re shaving. With the extra weighted handle, it allows you to put enough pressure on your face that you’ll really be getting a razor close shave. It also has a doubled edged razor as opposed to the regular butterfly opening that you’d find with your every day razor. This makes it much harder to cut yourself when using the Perfecto. At it’s price, it’s a really good option if you’re looking for the best bald head razor. Whilst some other safety razors are expensive, this one is a little cheaper and you won’t have to break the bank to purchase it. If avoiding cuts and nicks is a concern for you, then it makes sense to opt for a safety razor. The Perfecto and the Chieftain are great options, but there are also other options, like the Weishi. Similar to other safety razors, it’s a little bit more expensive than your standard disposable razor, but it’s worth that little bit extra. This is because the Weishi is weighted to help you get an optimal shave. If you’re used to using regular razors, then it might take you a little while to get used to using a safety razor as it’s kinda different. Because the cartridge is slightly different in the way that it’s made, a safety razor may irritate your skin for the first few attempts, though you’ll get soon get used to it (and probably prefer it). One thing that I prefer about the Weishi is that although it uses the butterfly shaving mechanism, it stays closed the whole time which makes it easier for you to shave quickly. Overall, it’s another good option if you’re looking for a quality razor. Ah, the old faithful. 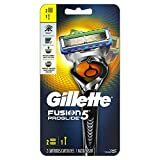 Many guys still swear by the Gillette Fusion 5 as their favorite ways to shave their head and get it looking razor sharp. If I forget my head shaver or my Headblade at home whilst I’m travelling, I’ll look to find the Gilette fusion if I can. It’s a solid option for anyone new to shaving their head, or someone who doesn’t like safety razors. The main thing that I like about these kinda of razors is that you can pick up a new one every few months because of their low cost. I don’t know about where you are, but you can often pick up a brand new one at a similar price as getting refills! In terms of getting a quality shave, I’d probably recommend you opt for the Headblade or one of the safety razors I mentioned. But for short term use, the Gillette works just fine. How to wet shave your head.. Properly! One of the most liberating experiences for a severely balding man is wet shaving your head. Letting go of your old receding, thinning look and then rebirthing as a powerful bald man is invigorating (okay, rebirth may be a bit intense but you get my point). But, wet shaving your head for the first time is undoubtedly going to leave you with either a cut, a red rash or a mixture of the two. Here, I’ll let you know how to avoid this. One common mistake that people make when wet shaving their head for the first time is not making it short enough first. If you have more than a weeks growth of hair still on your head, then it’s a good idea to use a set of hair clippers to make your hair shorter before that initial shave. After you wet shave your head for the first time, it’s pretty important to keep shaving it on a regular basis. This will help your head get used to the intensity of wet shaving. It’s also a lot easier for a razor to be effective on shorter hairs as opposed to longer hairs. Your hair should ideally be at stubble length before you go ahead and wet shave it. If you have a sensitive scalp, it can be a good to moisturize your head thoroughly beforehand to help prepare your head for shaving. You can actually get specific oils for this, though I’ve personally found them a waste of time because most shaving creams will have moisturizing ingredients in them anyway. Don’t rush wet shaving your head, especially the first time. Take your time, starting on the top of your scalp and working your way around the sides. It can take anywhere from a few minutes to 20 minutes, though this time will get shorter the more that you get used to shaving. For me, this is a necessity when shaving (even after wet shaving for many years). The back of my neck?still gets red after almost every shave; and trust me, I’ve tried shaving in every which way possible! The best thing for me to avoid having neck rash post shave is by using a good aftercare balm. I usually use the usually Nivea aftercare balm because I don’t see the necessity to spend out silly money on something expensive. When you’re looking to purchase a razor, there are a few things that you’ll want to consider. This is especially true if you’re looking for something to shave your head with, as you’ll want something that’s a little more sensitive than your standard razor. You’ll need to consider the amount of blades that your razor has. Now, there isn’t a one suits all blade amount for each person. Whilst cheaper razors tend to have two or three blades, the more expensive cartridge razors have five or even 6 blades. Now, many people say that more blades isn’t necessarily going to give you a better shave. But, personally I prefer a 5 or 6 blade razor compared to lesser blades. Unless you get a super cheap cartridge razor, then the majority of razors have a lubrication strip, typically made out of aloe vera. A lubrication strip, also called a moisturizing strip, can help to ensure that you’re going to get a smooth shave. For some people, a safety razor is going to prove to be a better choice than a cartridge razor. If you have more time and you want to get a closer shave, then a safety razor can actually prove to be a better option. Of course, a safety razor (unlike the name) can actually put you at greater risk of irritation and cuts on the scalp. So, you should give both different types of razor a try and see which one works better for your needs. Of course, price is something that you’re going to have to consider if you’re going to be shaving regularly. Though razor blades aren’t the most expensive things on the market, the cost does add up when you use them. Finding the best bald head razor for you isn’t easy, and the likelihood is that you will end up trying a few different ones before you find the perfect head razor for you. Whether you’re looking for a safety razor or a more normal choice, it’s important to try a few different options out. You might decide that you prefer a head shaver instead – I’d say it’s about 50/50 between the guys I know whether they use a razor or a shaver. Some guys prefer to take a razor to their head every day to keep it looking clean, whilst others only want to use a head shaver maybe once or twice a week. Either way, you should try both and see which way works best for you. Whether it’s a razor or a shaver, you will be able to find something to suit your needs.